This deed earns him the protection of the Corsicans, who control much of the prison system, and he works his way into Cesar’s core team. Alienated and without a clear identity of his own, the Muslim inmates regard him as a Corsican, and the Corsicans initially regard him distrustfully as an Arab. Malik is haunted by visions of the man he brutally killed, who had books in his cell and had encouraged the illiterate Malik to educate himself. 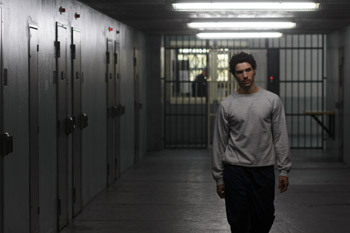 Although mostly set within the prison, Malik and the audience are let out when Cesar arranges for Malik to have day leave, so he can carry out tasks for him on the outside. The way this comparatively innocent young man has to fight for his survival and then through his almost prophet-like ability, to get himself into a more powerful position, forms the core drama. Jacques Audiard has said that he wanted to make a genre film to create iconic characters from people unknown in mainstream culture, or only dealt with in a stereotyped or socio-realist way. A Prophet managed to be quite different to my pre-conceived notion of it, formed by a trailer (of which there seem to be many different versions) and an article or two. I’m not sure exactly what I was expecting, but at the risk of sounding pretentious, it wasn’t something with such a varied cinematic palette. The White Ribbon, its main awards rival, makes an interesting comparison. While it is undoubtedly a masterpiece, Haneke’s perfect formal technique meant it offered few surprises in the way A Prophet did, for me at least, as someone not familiar with Audiard’s previous films. What both films do share is an amazing sense of immanent physical violence and extreme tension, but A Prophet utilises many more filmmaking techniques, and partly because of this is more conventionally entertaining. The visuals and sounds makes us experience the events subjectively alongside the characters, Malik especially, as if accompanying them. When Malik is driven off on his day leave, we see the trees whizzing by from his viewpoint, not vice-versa. The camerawork is 99 per cent handheld, with two steadier tracking-in shots towards Malik and later Cesar at defining decision moments, and I never got the sense that the camera had been positioned so the scene looked good -always because it served the story and characters. The cinematographer discusses the shooting style in this interview with the AFC. The sense of freedom when Malik steps outside at dawn on his first day release is beautifully conveyed by quiet birdsong, contrasting with the metallic sounds in the prison. American songs (including hip-hop) are used for dynamic montages conveying a sense of the appeal and excitement of a life of crime, Alexandre Desplat’s mournful orchestral score providing an emotional element. Malik’s visions of the man he murdered reminds him and us of that defining deed, and add a kind of magical dimension which helps elevate the film to another level. Only once did I think Audiard was going a bit far with the more experimental touches, with a dream sequence montage of running deer, but it paves the way for a stunning later scene which leads another character to use the word ‘prophet’ in relation to Malik. Niels Arestrup, the actor playing Cesar, when asked about Audiard’s directing of actors, compared him to a sculptor, and the whole film has the feeling of a wonderfully fluid sculpture, fashioned using every tool available. It contains beautiful details amid the taught narrative (I was struck by two shots of leaves, on the ground outside Cesar’s cell and then later on trees), touches on so many issues and themes that it has an epic quality despite the few locations, and is a totally refreshing addition to the crime thriller genre.